The year 2017 marks the 150th year that Canada has become a nation. This weekend there has been huge celebrations all across the our country. From air shows to car shows to antique and art shows to open air concerts to parades to picnics to barbeques there has been so much reason to celebrate. And of course there was firework displays to be found in cities, towns, neighbourhoods and in people’s back yards all across the nation. There were so many opportunities to participate on various activities. My main aim for the “Canada Day 150” weekend was simply to participate in a race. 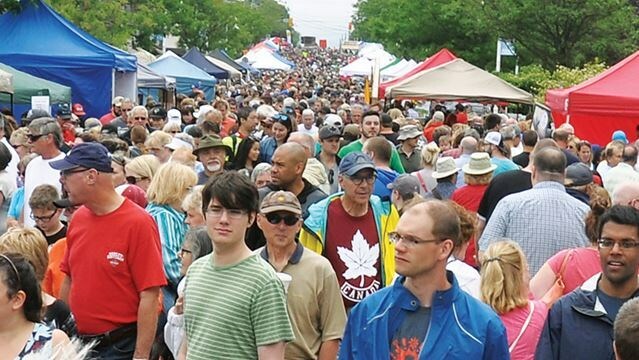 Fortunately my local city of Barrie hosts an annual Canada Day race as part of what is known as a street festival called Promenade Days. 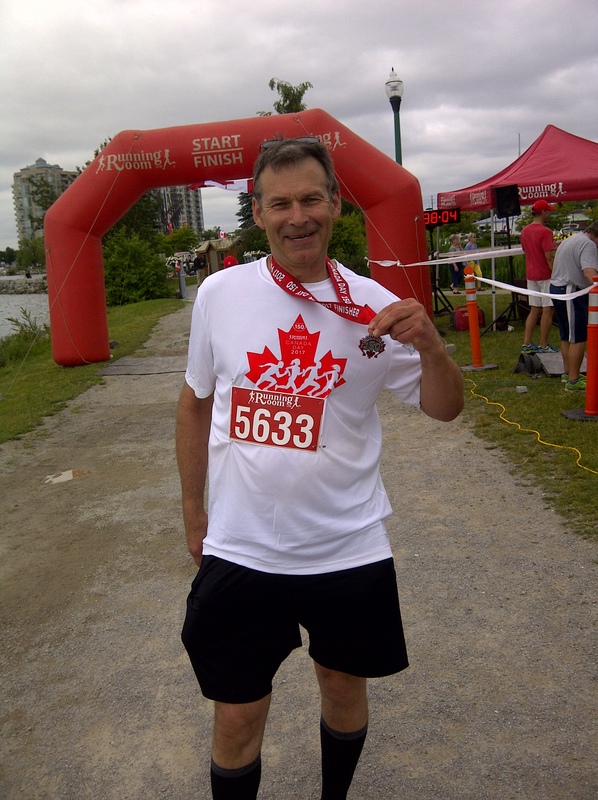 Proud of my “Canada 150” finishers medal. Thank you to the “Running Room” for putting on such a great race. 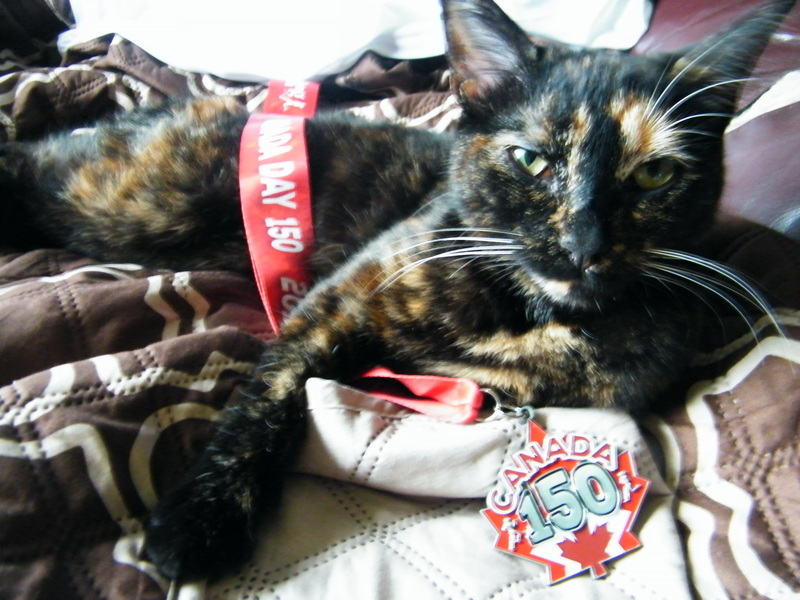 My daughter’s cat Hazelnut is also so proud of my “Canada 150” medal. Canada means many things to many people. For me there are two things that I really appreciate with of being Canadian. The first is the freedom and peace we enjoy. The Institute of Economics and Peace each year issues a Global Peace Index Report. Based on 22 different indicators a list is compiled of what are the most peaceful and the least peaceful of the 163 countries in the world. Canada ranks in at number 8 in the year 2017. Violence is extremely costly. On the Global Peace Index website it mentions “that the total economic impact of violence was $14.3 trillion last year in 2016, equivalent to 12.6% of the gross world product. This breaks down to $1953 for each and every person living on earth”. The second thing that I love with being a Canadian are our unique ways and customs that define us as uniquely Canadian. 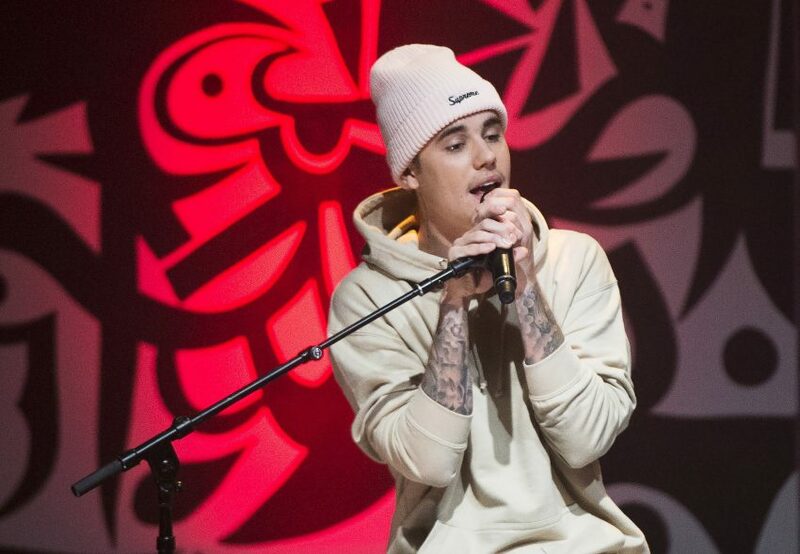 We wear toques, we drink pop, eat chocolate bars and sit on a couch. Our milk is sold in bags, our $1 currency is called a “loonie”. And we say “Eh”! 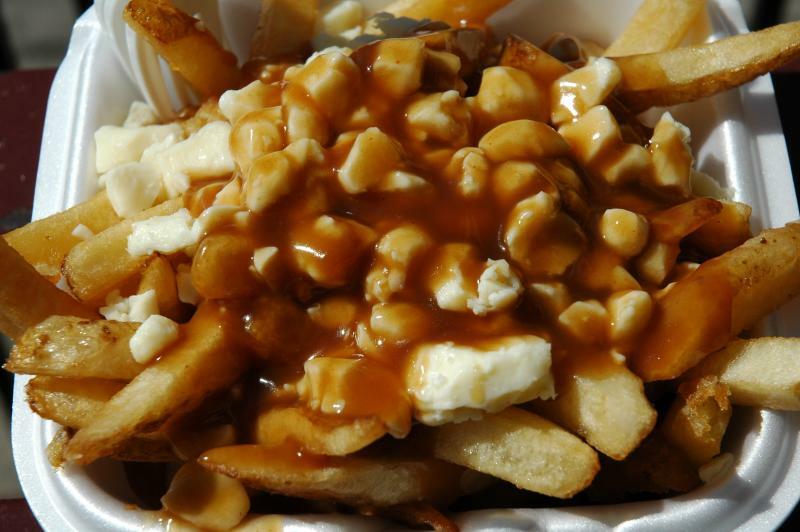 Some of the foods that are uniquely Canadian foods that you should try if you were to visit our country are Ketchup flavoured potato chips, Kraft dinner, Montreal smoked meats, our local maple syrup, peameal bacon, Nanaimo bars, bumbleberry pie and our famous artery clogging poutine found at any of the numerous “chip wagons” found throughout the country. Only recently I discovered that butter tarts is another item that is uniquely Canadian. Every week my sister bakes many dozens of butter tarts that she sells on Saturday mornings at the local farmer’s market in Barrie. She opens her table at 8:00 AM and tarts go very fast, usually sold out by 9:00 AM. So if you want some, you should get there early. She uses a family recipe that came from my great grandmother, passed on to my grandmother, passed on to my mother, passed on to my sister which she knows from memory for her baking. Image from “Ontario’s Best Butter Tart Festival” on Facebook. A lot of tarts for a town of 16,500. We are very blessed in Canada to have an abundance of fresh water. Fresh water is so extremely precious. Everyone really needs to be conscious of its conservation and protection. 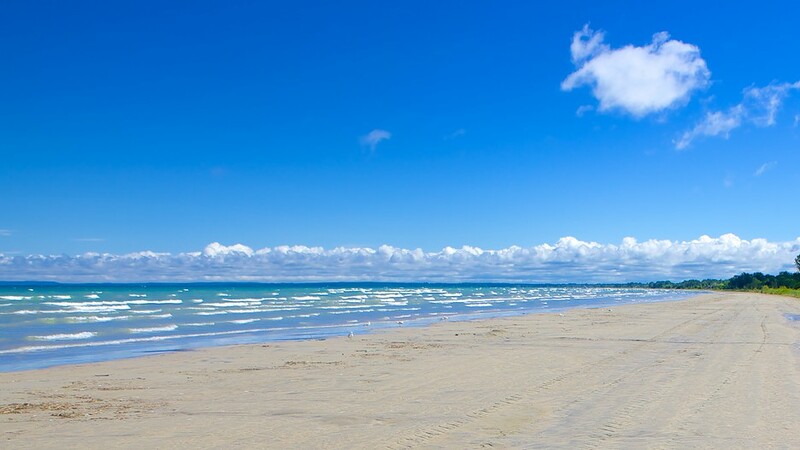 One of the cool things about the area I live is that the “world’s longest freshwater beach” called Wasaga Beach, is only a mere 25 kilometres away to the west. 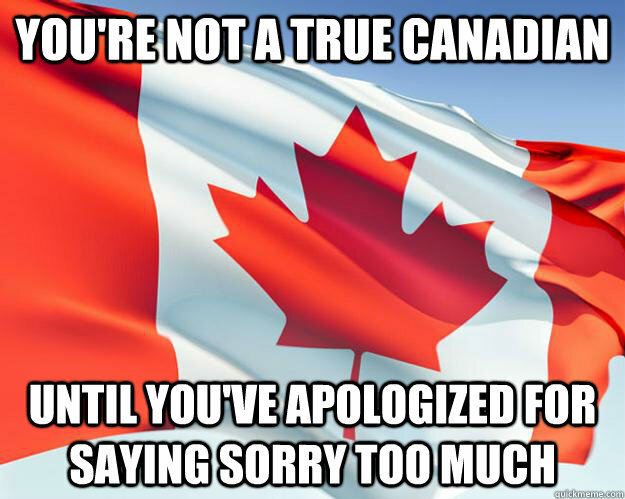 One last item that makes us very unique as Canadians is the use (or overuse) of the word “sorry“. This is a uniquely Canadian phenomenon, and I’ll be honest, I end up saying those words so often. At yesterday’s “Canada 150” race a runner stepped on my toes and I called out “Sorry, my foot was in the way”. Someone cuts you off on a crowded street? “Sorry!” A waitress gets my order wrong? “I’m am so sorry miss. I ordered poutine instead of fries. I am really sorry about that!” At a funeral I will nearly always say “I am sorry for your loss” to the grieving family. It certainly does not mean I was admitting responsibility for the death of the loved one. Problems would arise though, as everyone says sorry whether they are at fault or not. 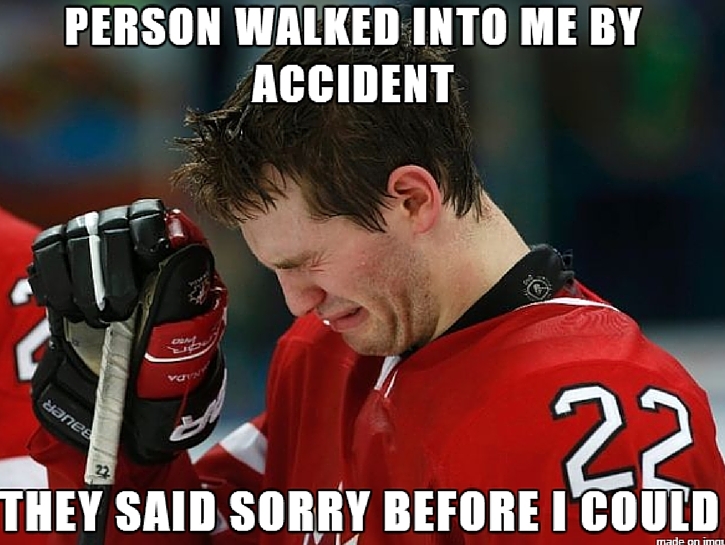 Suppose you were rear ended while driving to work, and you apologise to the person who just hit you. “Sorry for getting in your way, my friend. You must be in a hurry!”. In a court of law your apology might seem like you were at fault. Your cat wears your medal well Carl! P.S. I absolutely loved the picture of seagulls and if all goes well, I would be in Canada next year. I have my fingers and toes crossed. In all these years Prajakta, this is the 1st cat we have ever had. And she has been great. Just like people, I am sure cats can have different personalities. This one is playful, does not like to snuggle but at the same time likes to be around people. I took the picture of the seagulls probably about 5 years ago, long before I started a blog. I like going to the beach later in the day. 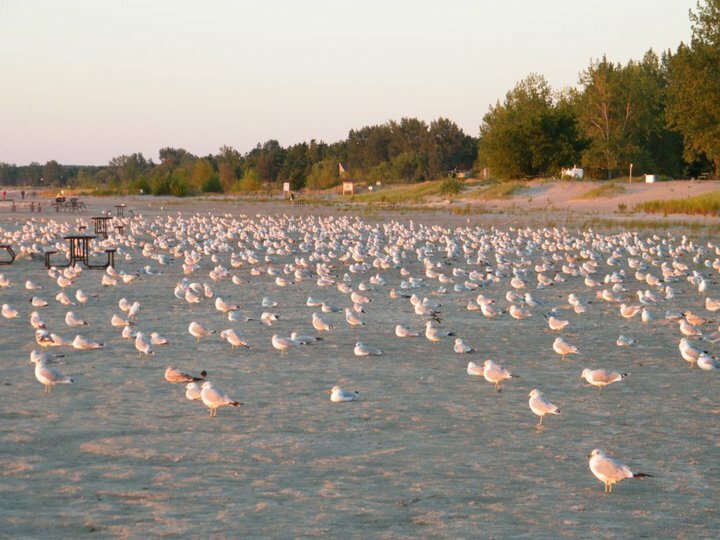 Less crowds, and the wildlife like these seagulls make themselves back at home. I keep wondering if I should move my family to Canada. I am so tired of the way things work in the U.S. You just gave me even more reason to do so. You also helped to clear up the 150 thing I keep seeing on Canadian Football Games. I had no idea what it meant now I do. Great post. That is so cool that you have been watching our CFL games. 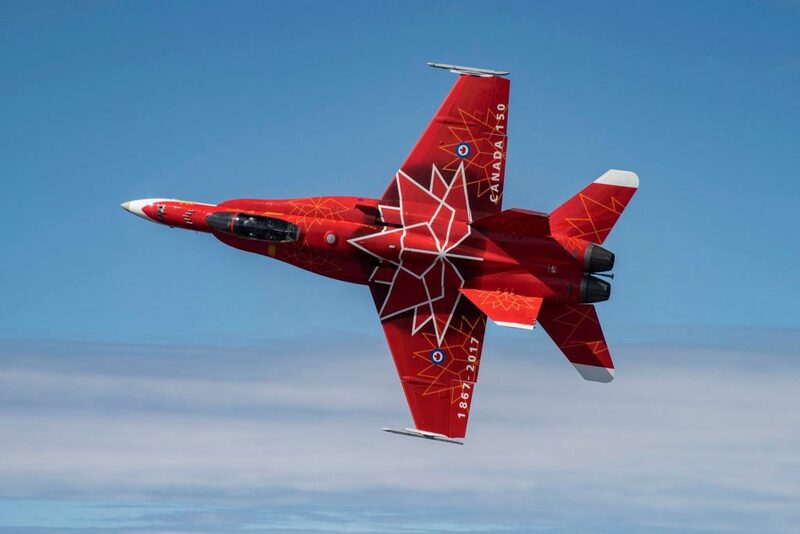 No doubt you would have seen “Canada 150” ads during those games The biggest celebrations were this past weekend, but there is also stuff that goes on throughout the year. There are pros and cons of living in both countries and you would have to research all that. The cost of living is far cheaper in the US. Lower taxes, cheaper gasoline, cheaper food, cheaper electricity and the list could go on and on. But one thing we do have is health care. It is not perfect by any means but it is nice to know that you won’t have to refinance your house if you break your leg. I guess the grass is greener on both sides of the fence this time. It would take a lot of planning to make a move like that. Do you have a favorite CFL team? I’ve heard the Roughriders have a huge fan base. I’m leaning towards the Redblacks right now. The Tiger Cats is my team I root for. Even though Toronto is closer to where I live, Hamilton has a much smaller population base. Personally, I always like to root for “the little guy”. The Redblacks in Ottawa are also a smaller city. And you are so correct about the Saskatchewan Roughriders. In the Canadian Prairies there are not a lot of professional sports teams and the Roughriders are adored with a huge base of such loyal, diehard fans. This is fabulous Carl. We are currently in Mexico with our American family so many of these uniquely Canadian things have come up. I’m notorious for saying sorry…a lot. Oh well good to be known as being a nice nation. 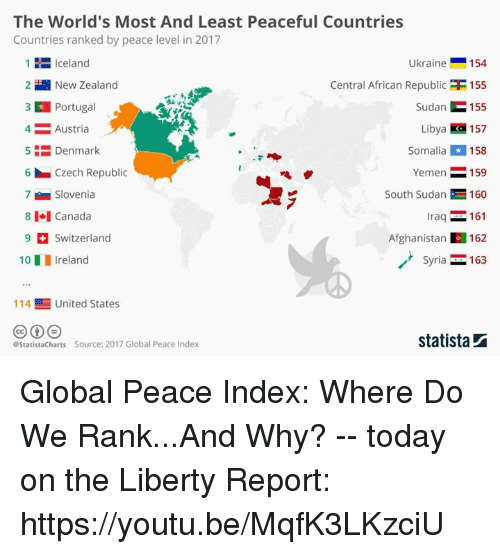 Interesting to see the Global Peace Index! Writing this has made me more aware of how often I do say “sorry”, and boy it is a lot of times in a day. I do hope the generations that follow us continue with that Canadian tradition. It really is a nice trait to have. Loved reading all this Carl. Glad things are so wonderful for you in Canada! I had no idea butter tarts were Canadian. I feel so sorry for the rest of the world. I love butter tarts (mostly made and consumed at Christmas in our family). And now I want some poutine. Thankfully, I got some last night – though that won’t stop me from eating it again next time I see it on a menu! Sorry it took me awhile to read your post….great and informative post! Some of the things I was aware of, but so many I wasn’t! Hope all is well with you! !…Love the pics! 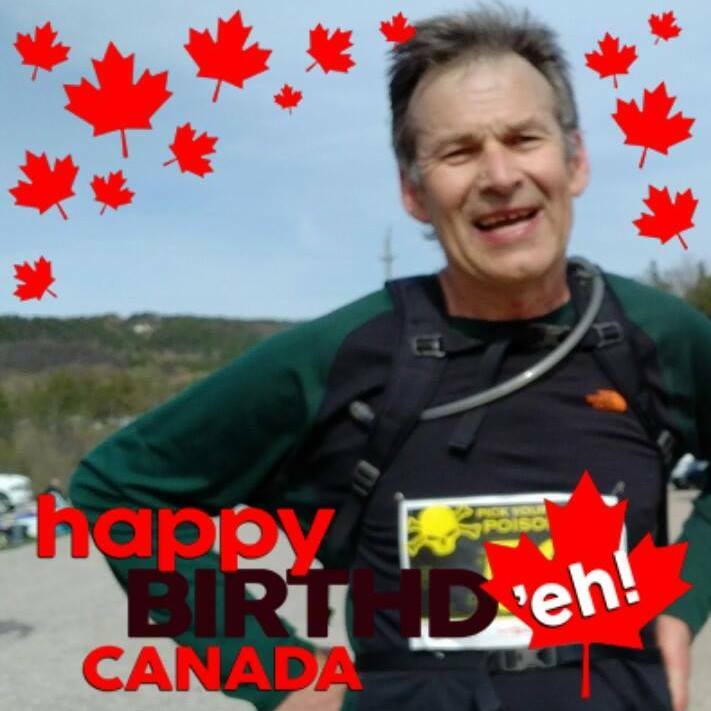 Happy 150th Birthday to your beautiful country! Oh, can you also explain getting your milk in a bag? Thank you for your kind Canada birthday greetings Tricia and for your wonderful questions. The “Apology Act” is indeed legit. I don’t know anyone personally that has ben affected by it in a court of law, but there probably was a court case that brought the law into being. I am saying sorry a LOT. So interesting about the milk. When I was in New Zealand last December the milk came in plastic jugs and it was so different to me. I am just used to plastic bags.. You buy them as a 4 litre bag.. There are 3 bags in that bag of milk. There are pitchers specifically designed to hold a bag of milk and you use scissors to snip the corner of the bag in the pitcher for pouring. The milk seems to stay fresher longer, and where I live the bags are recyclable. That is so very interesting Carl! You Canucks are sure very innovative. Not so much with the Apology Act though, sounds like a lawyer with too much time on his hands. Trust me when I says British say ‘sorry’ for everything! You get it from us! Whenever I visit my family the UK, I’m why are you sorry? You did nothing. Happy 150th Independence from my ancestors! haha…love this Natalie. And I had no idea the Brits are the same way with saying “sorry”.. No doubt that is exactly where we got it from! 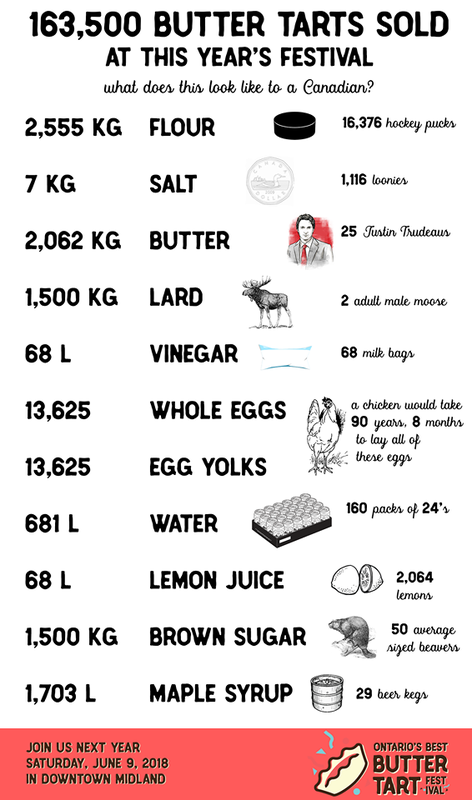 loved the humor – and the chart totals for this year’s butter tarts with the Canadian equals – bah! too funny…. So wonderful to have you here Yvette. Have missed you here and have missed your posts, but know you have had a “blogging break” which is SO very important. There is a family farm just a mile away that also has butter tarts. There are so many types, and the sweet/sour of lemon and maple syrup is one of them. And custom order. They even had maple syrup and bacon custom order. And also gluten free, My wife is anaphylactic with wheat. We are so very careful at home and eat at one particular restaurant when all the staff knows her and her condition. Also places like this farm where she knows there is no wheat contamination. Carries 2 epi-pens, despite all that has still had a few ambulance trips to the emergency. Hoping your wheat issue is not too serious. 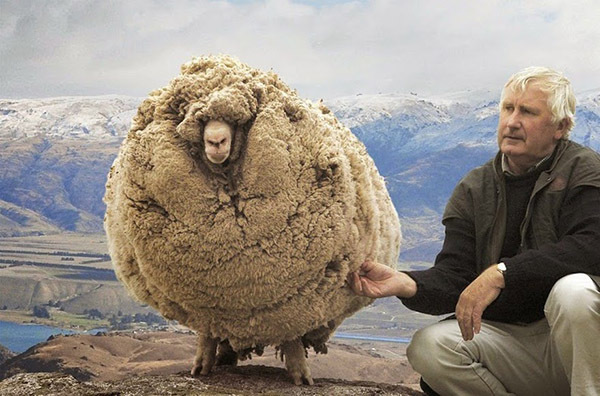 Definitely would be serious enough that you stay away from wheat. I”m so inspired by all this running you do. I’m 36, and the doc has already forbidden me from running due to arthritis. Do you not have arthritis? Do you just run anyway? Thank you so much for dropping by April. And I sincerely sorry that doctor’s orders are forbidding you from running. I know you have loved running, and this must be very hard for you to accept. I do have some arthritis my friend. Many years of sleeping out in tents and 20 years of working on water well drill rigs where I get soaked pretty much each day has taken a toll. Some days are better than others, but I do feel I am very fortunate as it could be much worse. And some people my age suffer much worse than me. I am not too sure how my running has affected my arthritis, whether it has helped or aggravated it. But in my 4 years of running it has not really gotten much worse. I try to listen to my body, and take many more rest days than the average runner. Most weeks I am on the trails only once or twice a week, but also do cycling, stair climbing and strength training. Together they all help prepare me for these long race events that I enjoy competing in.